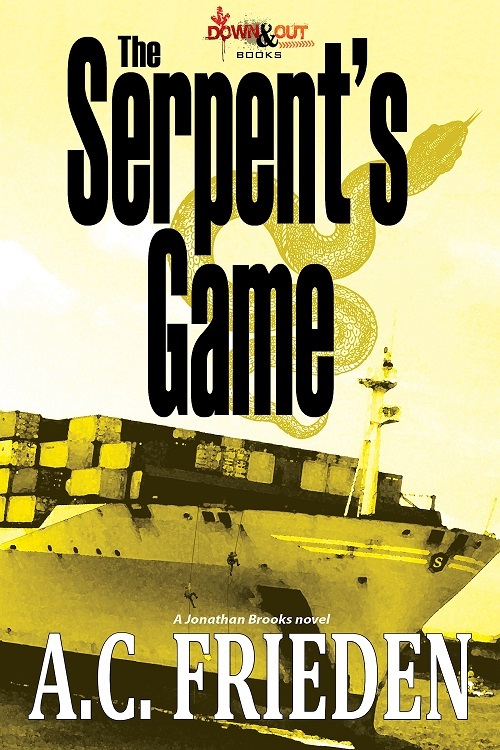 CHICAGO, IL (Jan. 2, 2014) – The Serpent’s Game, A.C. Frieden’s latest spy thriller in the Jonathan Brooks series, was released in December, 2013. In his prior globetrotting thriller Tranquility Denied, A.C. Frieden masterfully fused Cold War espionage, tense courtroom drama, a collision at sea, and a frantic search for the truth behind a sinister plot involving some of the world’s most dangerous weapons. In the new sequel The Serpent’s Game, Frieden returns with his most high-stakes novel to date. Only hours before Hurricane Katrina barrels down on New Orleans, maritime lawyer Jonathan Brooks faces a tough choice: seek refuge out of town or help Mariya, a figure from his past, locate her missing nephew feared drowned in the Mississippi. His law firm now on the brink of financial ruin and facing the storm of the century, Jonathan is burdened with responsibility. But Mariya is no friend. The sultry Russian provocateur saved his life a decade ago but not without dragging him into a world of murder, mayhem and deceit. As darkness bleeds into the Crescent City, Brooks’ search for the truth behind a body in the river catapults him into an international storm that sweeps into the espionage underworld of Russia, the intelligence centers of Washington, D.C., the politics of North Korea, the waterways of the Panama Canal, the back streets of Havana and the barrios of Caracas—and into the heart of Jonathan’s own darkness. So far, the novel’s reviews have been superb. Crimespree Magazine calls The Serpent’s Game “an intelligent and intriguing spy thriller.” Bookreview.com describes it as “some of the best writing about the early hours of Katrina,” and Jamie Freveletti, author of Robert Ludlum’s The Janus Reprisal, calls it “a gritty, complex and satisfying thriller.” The Serpent’s Game is available in ebook from Down & Out Books and in paperback from Avendia Publishing. Frieden’s next thriller in the series, The Pyongyang Option, will be released in fall 2014 and is set mainly in Washington, D.C., Kiev, Ukraine, and Pyongyang, North Korea. (above) Frieden prepares for another training flight to test various emergency scenarios, which were important for him to write a realistic action scene involving a seaplane in his latest thriller. About the author: A.C. Frieden is a Swiss-Brazilian-American novelist, lawyer, pilot, diver and former sniper and currently lives in Chicago. He is the author of several espionage novels and other literary works, both fiction and nonfiction. For more information, visit his website at www.acfrieden.com or his blogs on literary research travel, writing, diving and piloting. To interview the author, visit his official website or send correspondence to: media@avendiapublishing.com or eric@downandoutbooks.com.